FAQ - How do I create a POST? In Conversations, you can share and communicate with the GROUPS you have created or accepted as part of your Livingtree network using a POST. 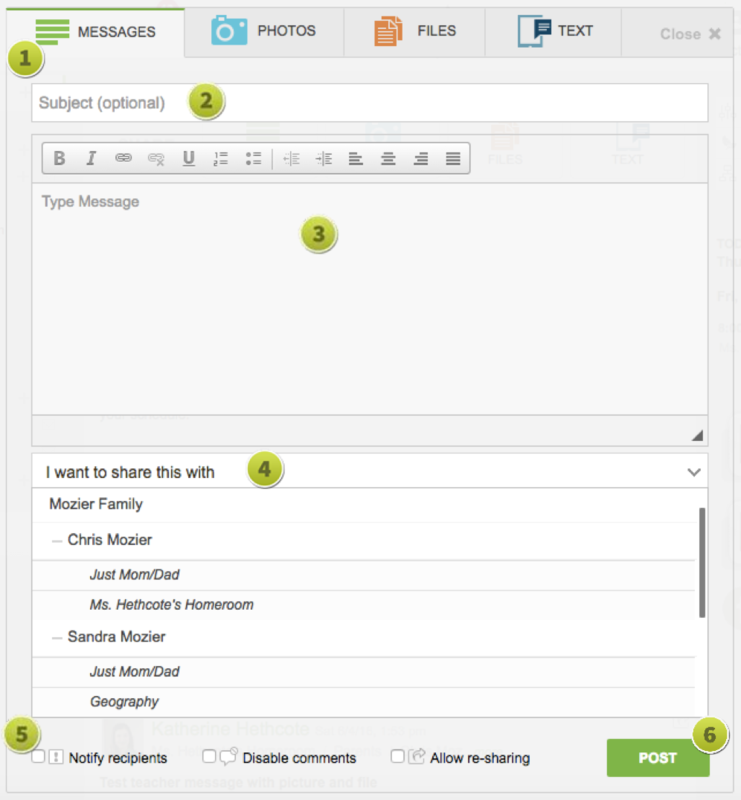 There are four POST types you can share: MESSAGES, TEXT, PHOTOS, or FILES. Select the MESSAGES tab at the top of the Conversations page. If you like, add a Subject line here. Recipients will see the Subject in bold on your POST. If notifications are enabled, the Subject will be visible in Email Notifications and/or Mobile Push Alerts, too. Select which GROUPS you would like to share with using the drop down menu. You can select as many GROUPS as you desire. Check Notify recipients to notify members of your POST. Recipients will receive the notification in their email INBOX. If they have the Livingtree app on their smartphone, they'll also receive a Mobile Push Alert Notification. Check Disable comments to keep recipients from commenting on a POST. Check Allow re-sharing to enable recipients to share a POST with GROUPS in your Livingtree network. Checking this box will not allow others to edit your POST. Also, any comments on your POST will not be re-shared. When you are ready, click here to POST.